That thing is too cool! This is super intriguing! Kenner making video games? Seems totally possible! So easy to speculate on this. 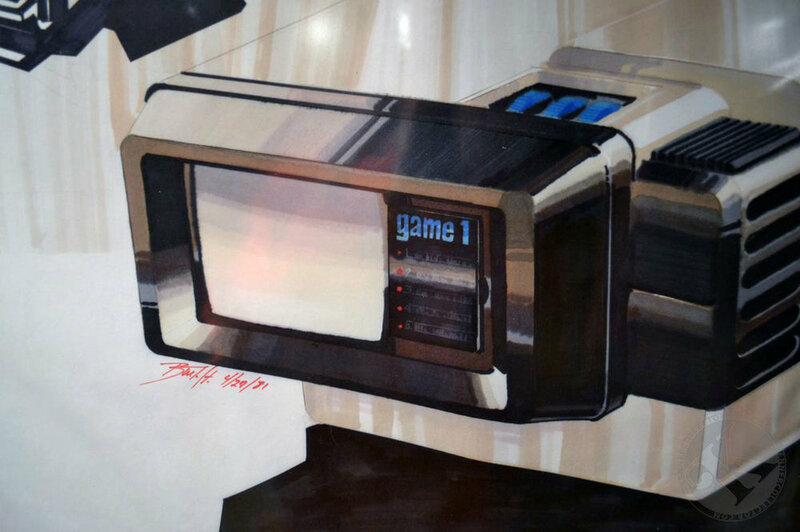 If the concept art is dated April 1981 it's easy to see how Kenner would've looked at Atari at that point becoming the fastest growing company in American history, and seen other toymakers like Mattel, Coleco and Milton Bradley jumping into the video game craze. Was this just some guy sketching out ideas, or did this become a defined project that eventually got canceled? I can see a toy company like Kenner wanting to get into video games in 1981, sketching out ideas and then canceling their project because of costs or the looming video game crash. And as you said, maybe this isn't exactly a video game system at all. I love how you're thinking critically about this in your video, thinking things through logically and trying to figure out what this could possibly be. I agree with your speculation completely. It's right in that little pocket of time between 1979 and 1983 when everybody was trying to jump into that market. If it were a video game console why didn't it come out? Maybe they foresaw the crash coming? That sure looks like a Beta tape. Was this a portable VCR? Those sure look like controllers nestled in the top with two buttons and a D-Pad. Why would the little video screen say "GAME 1" if it's not supposed to be a video game? Maybe there's something to all this. Thanks so much bro. You summed my entire video/thought process in 2 simple paragraphs. Lol This could be anything from a simple "let me come up with an idea for the boss to look at" sketch all the way to a full fledged concept that never made the distance. Its more so fun that this kind of stuff ia still popping up, even in 2019. Lol This could be anything from a simple "let me come up with an idea for the boss to look at" sketch all the way to a full fledged concept that never made the distance. Having a little experience in this area I'm looking at all the detail in this concept - the game screen with some interactive details to the right of the screen, the top loading cassette / cartridge, what appears to be the two game controllers, the handle and the portable nature of the console - all those details suggest to me that the industrial designer who created this concept art did so based on a list of detailed parameters. As though he was handed a spec sheet with "portable cartridge console with interactive game screen and two removable controllers" already defined. And if that's true that means at some place, sometime, people met inside Kenner to conceive of this product, define specs and give the go-ahead to have someone start working on designs. It feels like there was some idea of what this product was going to be before the sketch was made. It's entirely possible this was a designer with some free time sitting at his table sketching out blue sky ideas to present at Kenner, but my gut instinct is that if this were just a designer sketching out ideas, the concept art would feel much more "sci-fi" and "Blade Runner" dejecting a broad concept, rather than look so specific and functional. If I had to make a bet looking at this, my gut instinct is that a project was started, early specs were defined and the designer came up with some concepts based on those specs - and then something happened where the project went into limbo and was then canceled before anything substantive had been created. I don't think this was something like the Atari Cosmos where working hardware was finished nearly to completion, with games developed and packaging made before the axe fell from some corporate overlord. My feeling is that if Kenner had moved this project beyond the early stages with a console developed and and games written for it out there somewhere, we would've heard more about this through the years as we have with the Hasbro NEMO system that Night Trap and Sewer Shark were originally developed for. It's possible though! Its more so fun that this kind of stuff ia still popping up, even in 2019.
lol yes! I love that. There's probably a lot more out there we don't even know yet. Think of all the game console concepts that were announced using Linux that never made it past a prototype model...if they were lucky enough to make it that far. My gut says it was an idea, few meetings and a sketch. Maybe another few meetings then scraped. Tons of concepts hardly make it past this stage, but you know that. But that is what I think happened, just another quick look at an idea and then they moved on.